With Christmas fast approaching I see the buzz about the Elves making their appearance at little girls and boys houses and I’m sure you have too! So what exactly is Elf on the Shelf? This is a fun tradition to start with your little ones! When you adopt (purchase) a special elf and name him or her, they receive Christmas magic! 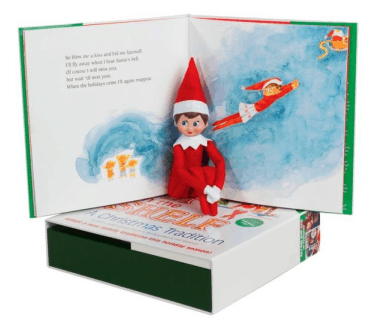 As soon as everyone is sleeping, your elf reports back to Santa whether you’ve been a good boy or girl that day (don’t worry, the Elf comes with a book to explain his story and his mission to you the kids). The elf is moved around to different hiding spots each night so when the kids awake it becomes a hide and seek game. Be careful… elves have been know to be a bit mischievous… and can be found in the morning doing some pretty silly things! 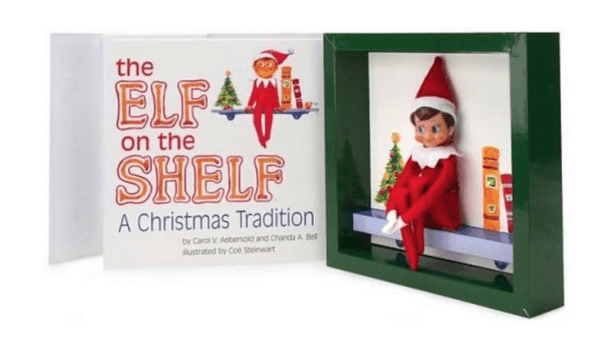 If you don’t have an Elf on the Shelf and you’d love to start this tradition with your own family, you can get one on Amazon! Last year they were sold out at most stores around me and I had a really hard time finding one! I always wanted to have because of the magic that they make me feel about Christmas !! she gets up and looks for him. If we don’t win this one, I hope to find one before Christmas. My grandsons would love one of these. Oh I just love that ! Would love to win the Elf on the shelf for my 10 kids. Have wanted one for a couple years now, but have not been able to get it. It would be a great family tradition to start! These elves are sure to bring smiles to many faces! These little guys and gals are so cute i hope to have one soon! I would love to have thus little guy join our family! Thanks for the opportunity to win one! My grand kids would love this! What a great way to start the holidays with Elf on a Shellf! Would Love to Give one to the Grad babies. I woud love to win one. I’m amazed that my grandson talks about the Elf his mom puts out every year. I absolutely love the concept. I’d like to have one at my house so Landon will truly believe Chippy is watching his every move. When the movie came out, we all watched it together. We’ve now made it a family tradition. Since my son and Landon’s mom are not together, this is a great way to help Landon understand he’s loved by many even if his parents don’t live together. I really like the thought of this!! !What do you think!!! Would love to win this Elf on the Shelf for my granddaughters. I can’t even bye them a Christmas Gift this year don’t have don’t have any money. After paying for bills and food for us there’s nothing left. Have to live on $1,093.00 a month, that’s hard to do. The grand kids love Elf on the shelf they love watch the show when it comes out.. we saved it on our DVR box but lost it when we had to return the box cause it was broken.. waiting for it to come out again so we can record it again.. I have a collection of elves from my mom and my aunt, who are both passed on for several years now. I set them up each year to remind me of the joyious christmas’s past i had as a child, filled with much love, laughter, togetherness, and hard work. They were the elves in our family and made sure eveyone had a good christmas. Ooh, what a cute little elf on the shelf. The elf will surely replace the pumpkins around the house. I love it, and the grandkids will have fun looking for it every time the stop over.